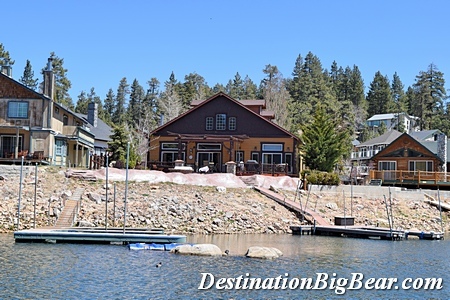 If you are looking for a fabulous mountain vacation there is no better place in southern California than Big Bear Lake. With over 330 days of sunshine, Big Bear Lake sits nestled amongst the pine trees, surrounded by mountains and is just a couple hours from Los Angeles, Las Vegas, San Diego and Palm Springs. 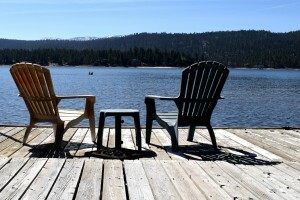 Here are 4 reasons you should get your friends and family together and rent a lakefront cabin rental in Big Bear Lake! Nothing beats watching birds and boats out on the water from your lakefront Big Bear Lake cabin rental. Whether you are on the north shore or the south shore, sitting out on the deck enjoying the sunset with a glass of wine or cup of tea is one of the best ways to unwind. Big Bear Lake is surrounded by mountains and make a beautiful backdrop to the blue waters of Big Bear Lake with clear, sunny skies above. The Fourth of July is a fun holiday full of celebration, bar-b-que and family. When night falls, you can have front row seats to the big show right from your lakefront cabin rental in Big Bear Lake. If fishing is a favorite pastime, it’s easy to just walk down to the water’s edge or hop in your boat from the private dock of you Big Bear Lake vacation rental. Mornings are a great time to take a stroll on the shore while the water is calm and the mountains are just starting to wake up. 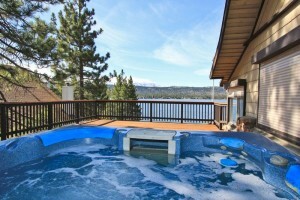 Coming up to a cabin rental in Big Bear is all about relaxation and leaving the stresses of home behind. Make the most of your getaway at a lakefront Big Bear Lake cabin rental and enjoy the views while you soak in a hot tub overlooking the water. You can even book a mobile massage to melt away tension right on your private deck overlooking the lake. Family vacations are popular in a Big Bear Lake cabin rental. What better way to make memories that last than having fun fishing, kayaking or just playing at the beach. Kids of all ages will find something to do and create life-long memories. Don’t forget to pack your camera! To book your Big Bear Lake lakefront cabin rental, call (909) 752-0234. Destination Big Bear has luxury lakefront vacation rentals, budget cabin rentals and pet friendly lakefront cabin rentals in Big Bear Lake. Let our vacation experts help you plan the perfect getaway!